Cars move along Aviation Boulevard just west of Prospect Avenue in Hermosa Beach. A draft proposal for changes to Aviation included the removal of traffic lanes in the area to make space for a bike lane. Recently released draft proposals to reshape the Aviation Corridor, including by possibly removing traffic lanes in some areas to make space for a bicycle lane, face deep skepticism from those worried about how the plans would impact traffic. That became evident Monday night when several dozen people gathered at the Hermosa Beach Community Center for the third and final discussion of possible changes to Aviation Boulevard. The proposal originated with a grant — awarded to Hermosa, Manhattan Beach and Redondo Beach by in 2013 by the Southern California Association of Governments — that allowed them to consider modifications to Aviation between Rosecrans Avenue and Pacific Coast Highway as a way to demonstrate the possible impacts of “Living Streets” design principles. These principles could theoretically guide the redevelopment of other thoroughfares in the future. The proposals are likely several iterations and at least six months away from being agendized for consideration by any local government. The Beach Cities are in the process of adapting the county’s guidelines to reflect their own needs and populations, as well as to account for the significant changes in the countywide transportation network that have occurred since 2011. But, as was the case with other local forums related to Living Streets, Monday’s gathering revealed that at least some of the area’s population has a fundamental disagreement with the idea of using a street for purposes such as biking and walking, instead of merely moving cars as fast as possible. “When bikes start paying the registration fees that fund our streets, then they can start sharing our lanes,” said Hermosa resident Bob Atkins. Atkins said he does not have a problem with cycling, but described the Aviation fixes as a “solution in search of a problem.” The most cost-effective improvement, he said, would be to better synchronize the traffic lights to prevent congestion, which he argued would discourage risky behavior by motorists trying to shave time off their drive. Horizontal printouts of two proposed designs for the stretch of the corridor — one that could be accomplished relatively quickly and another, more ambitious plan that would need more time and money — stretched out over plastic tables covering almost the entire length of the lobby of the Community Center theater. The area near the intersection of Aviation and Prospect Avenue in Hermosa, where an added bike lane would reduce the street to one lane in each direction, attracted a disproportionate share of color; the more futuristic redesign sited a traffic circle in the intersection. 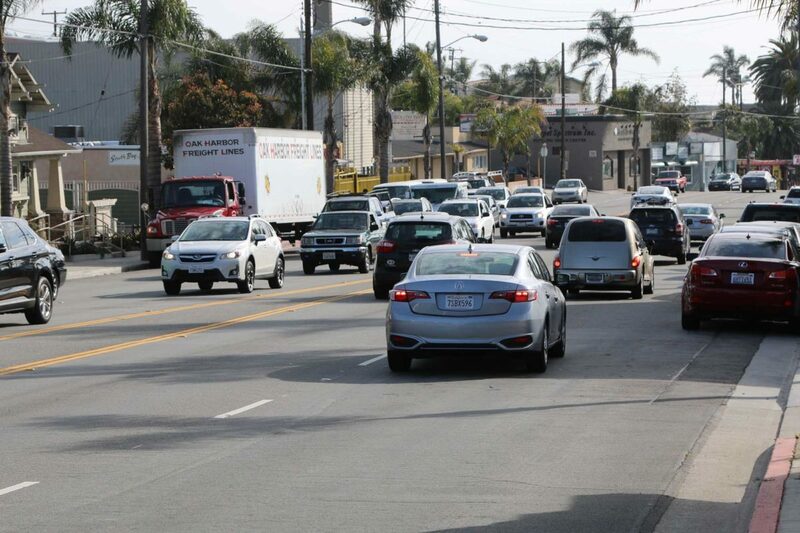 The latter recalled the rage produced last summer when the temporary removal of lanes on Vista del Mar vexed South Bay commuters who relied on the route to get to the west side. The lanes were restored thanks to intervention from the county, but the memory of the associated delays still stings. Among the loudest critics at Monday’s meeting was John Russo, a Playa del Rey resident and member of Keep LA Moving, an umbrella organization that emerged following the lane closures and now continues to cast a watchful eye on mobility initiatives. It is unclear whether the negative response Monday is representative of broader public sentiment. Academic studies of the subject have frequently documented the public health and economic benefits of initiatives similar to those in the Living Streets manual. Rock Miller, a former Stantec consultant who helped produce the designs, has worked on hundreds of similar initiatives throughout the United States and Canada. He said that even modest investments often produce large gains in the share of people using alternative modes of transit, especially in places with temperate climates. “A small amount of bike infrastructure tends to greatly increase use,” Miller said. Nonetheless, he acknowledged that there is often a trade-off between “livability” and the number of cars a road can move. He encouraged planning officials in each of the cities to conduct polling to see whether residents wanted to prioritize traffic flow or other street uses.